And to conclude the “Introducing” series (for now at least), let me introduce our pets. Charli is our cat. Apparently she’s a Domestic Short-Hair (yes that’s a breed), but as she is a pound cat, I’m sure there’s a some bitzer in her somewhere. We adopted her mid 2009 from Save-A-Dog Scheme Inc, which is a community-based not-for-profit animal welfare organisation that saves hundreds of dogs and cats from being killed every year. Charli was 2 years old when we adopted her, and she had spent her entire life at the centre, as her mother had been brought there whilst pregnant. Charli, starting to relax, just a couple of days after we brought her home. When we brought Charli home, we first introduced her to the bathroom where her kitty litter would be kept. She was very affectionate and happy. But when we opened the bathroom door to the broader house area, it was obvious she wasn’t used to being in such large spaces. She spent the first night sitting inside the bathtub – being an approximate size to the cage she was used to, purring and content. She was happy for us to pat her, but she wanted to stay there. After a day or two, she settled down a bit, but it was probably 3 months or so before you could say that she was really used to being in a house environment. 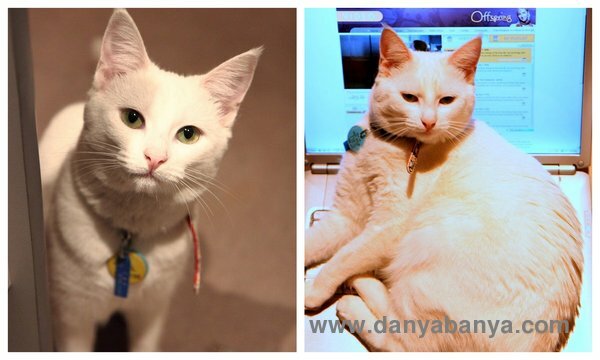 Being a white cat, skin cancer is a big risk, particularly with our harsh Australian sun and the hole in the ozone layer above us. She is not allowed outside for the 3 months of Summer, and in Spring & Autumn (Fall) we put sunscreen on her ears before she goes outside, and try to restrict the times to early morning and late afternoon. It is only in Winter that we let her have free roam during the daylight hours. All year round she is kept inside at night, as in Australia, cats don’t mix well with our native nocturnal fauna, such as our possums, sugar-gliders, etc. A year after we adopted Charli, we brought a little screaming JJ home from the hospital. Charli popped up on her hind legs like a meerkat, so she could see the baby from the other side of the room, with the most concerned look on her face. From day dot Charli was very maternal towards the baby. She learnt early on that she got lots of pats if she sat next to me on the couch whilst I was breastfeeding, and so in the early days, I had company, no matter what time of night JJ fed. Now that JJ is a jumping shouting toddler, the relationship is different, yet no less affectionate. Charli will passively let JJ poke and prod her, and puts up with toddler squeezes and kisses. It will be interesting to see how Charli reacts when we bring a second baby home – she is so used to kids now, I wonder if she’ll even notice! Vomit & Gromit are our two Comet goldfish, and Mike is our Black Moor fish. They too were “saved”. Two of our friends had a wonderful harbour cruise wedding several months ago, with Comet & Black Moor fish as the table centre-pieces. After the wedding, the fish needed a new home, and so we adopted six. They live in a 26 litre (roughly 6.5 gallon) fish tank, about a foot cubed, with lots of fresh plants for them to hide behind & nibble on. Alas, three of them didn’t last the month, but Vomit, Gromit & Mike have stuck around, and seem to like their new home! Ringtail possums are one of Australia’s native nocturnal marsupials. They are very cute, being only about 30cm (a foot) long, excluding their long tail. With encroaching urbanisation swallowing up their native environment, they have learnt to share our suburbs by making nests in roofspaces, as the possum that lives at our place has done. I’m tempted to rehouse it using these humane recommendations, but JJ is so fond of having a possum in the roof that we’ve decided to leave it there for now. We hear it scratching around in the roofspace each dawn and dusk, and often see it sitting on the fence or in the trees if we’re outside when it is dark. Chocolate & Beetroot Brownie Monkey Cake! 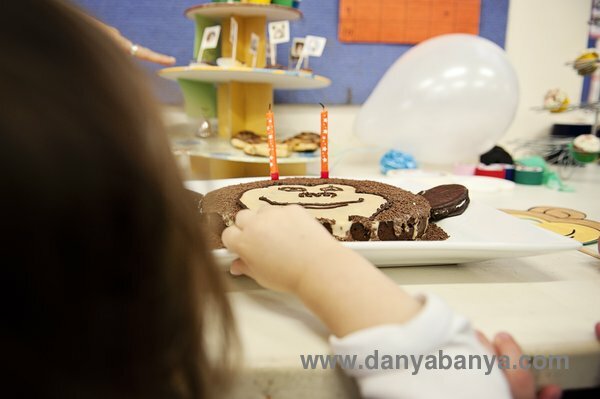 I made this chocolate and beetroot brownie monkey cake for JJ’s zoo animal themed second birthday party. We used the same monkey face design that we used for the monkey masks. I used this Chocolate & Beetroot Brownie recipe from Vegie Smugglers, except that I used a round spring-form cake pan instead of a rectangular one. To make the beige / light brown icing, I mixed up icing sugar mixture, water, a touch of cocoa and one tiny drop of yellow food colouring (that stuff goes a long way!). 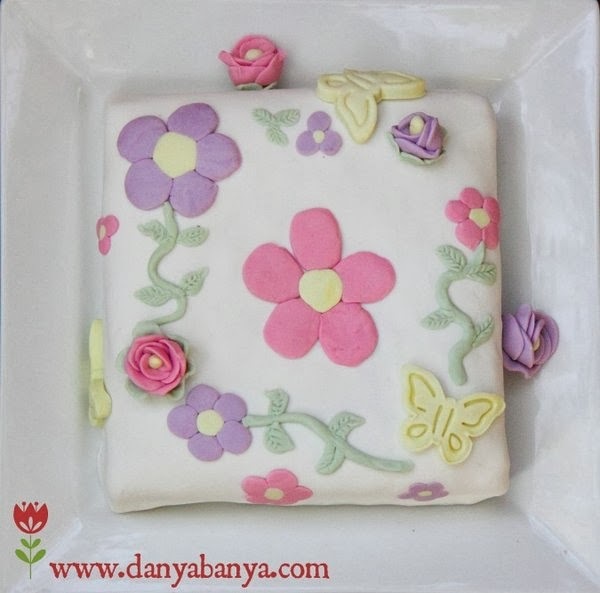 I spread the icing to colour the whole cake, and then covered up the middle section with a piece of baking paper that I’d cut to size. I liberally applied chocolate sprinkles to the outside, uncovered parts of the face, patting down the sprinkles so they stuck to the icing. I then removed the baking paper, and added more icing to the middle section, bringing it up to be level with the chocolate sprinkles, and fixing up any areas where the sprinkles had crept in as I went. I then left the cake out on the bench overnight for the icing to set. (I covered it with a box to keep our curious cat at bay). The next morning the icing was nice and hard, and the monkey face outline was still prominent. Yay! I then cut a third off two wagon wheels (a type of Australian chocolate biscuit) and put them on each side for ears. 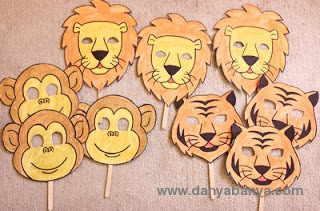 If you’re planning a zoo animal themed party, you might also like these zoo animal face masks and Easy zoo animal cupcake toppers. And here’s the photo that we used as the background for JJ’s party invitations on. Cute, no? 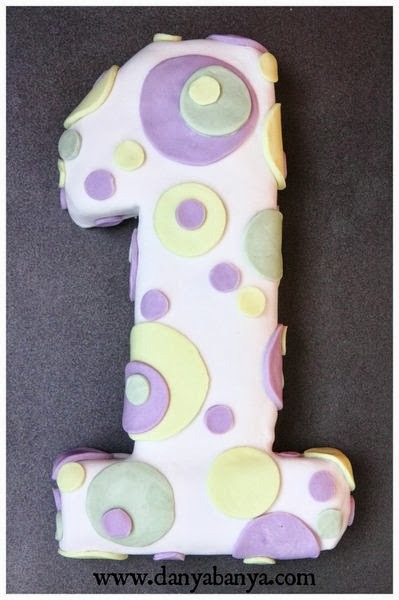 Or if it’s cakes you’re after, here’s a few other ones I’ve made – the ‘1’ cake, a ‘floral’ cake, and some professional-ish looking cupcakes. I printed off 3 copies each of the lion, tiger and monkey templates from this website. I painted each one and left them to dry. Then the next night I retraced over the black lines with a thick permanent marker, UHT glued each mask to some card stock, and then cut out the face and the eyes. To finish, I masking-taped a paddle pop stick (aka craft stick) to the back. And voila, masks are done! 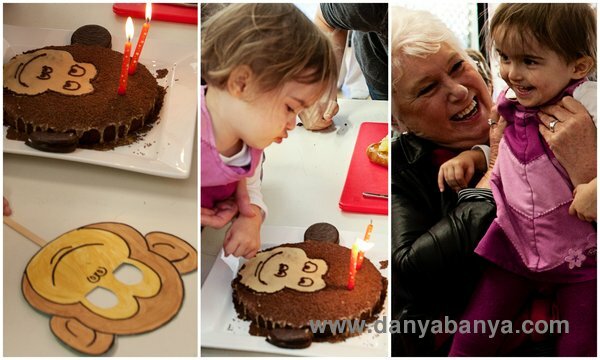 And if you’re holding a zoo animal themed party, you might want to check out my Chocolate & Beetroot Brownie Monkey Cake and Easy zoo animal cupcake toppers. 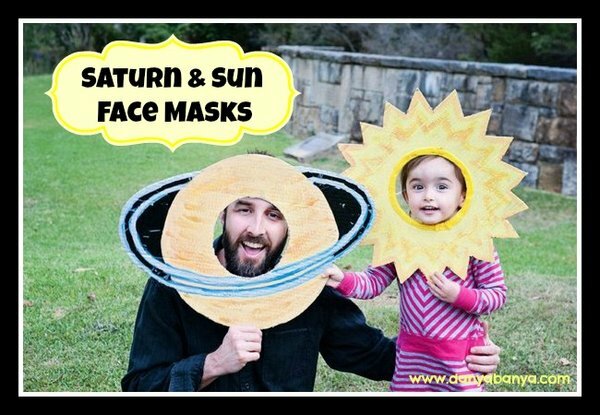 Or, if it’s masks you’re after, I’ve also made some Space themed ones – here is how to make Sun and Saturn face masks. 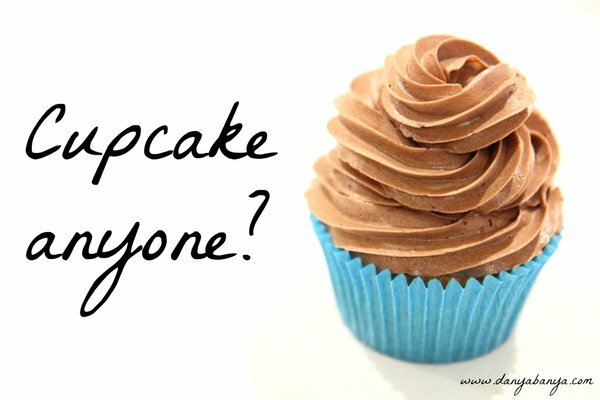 These cupcake toppers are so easy to make! I made a batch of about 50 or so in about an hour. We made zoo animal themed ones, but you could easily adapt to suit any theme. I bought two sticker books from the local discount shop, but as each book had 180 stickers (enough for 90 toppers), one would have been plenty. They cost me $2 each. I already had the rest of the supplies, so all up this project cost me $4! Grab a few sheets of paper – I used normal printer paper, or you could use coloured paper if you prefer. Cut the paper using regular scissors into little rectangles about 4cm high and 8cm wide. Glue one side, put a toothpick in the middle and fold the paper in half over the toothpick, effectively gluing the two halves together. Stick a sticker onto each side, centred by height, keeping as close to the toothpick as possible. Then use the pattern-edged scissors to cut off the excess paper around the stickers. Choose pattern-edged scissors with a small pattern – I used the stamp pattern ones, but the mini pinking or mini scallop pattern ones would work just as well. And voila! Homemade, zoo animal themed cupcake toppers! They turned out quite well, especially considering how little time, effort, cost and resources were involved. 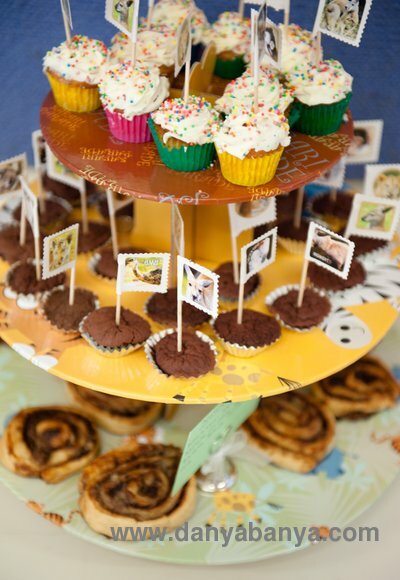 And if you are wondering what the little treats on the cupcake stand are? The top layer are grandma-homemade cupcakes (thanks Mum!). The second layer are egg-free cupcakes (to cater for some of JJ’s friends with egg allergies). They were so creamy! I’ll see if I can find the recipe to share with you… The third layer are wholemeal banana and Nutella (hazelnut spread) scrolls. I based them on this recipe, but used wholemeal (wholewheat) flour, added banana and deleted the crushed hazelnuts. They weren’t the prettiest, but they were yummy, and kind of healthy. (I had to sneak wholegrains in somewhere). 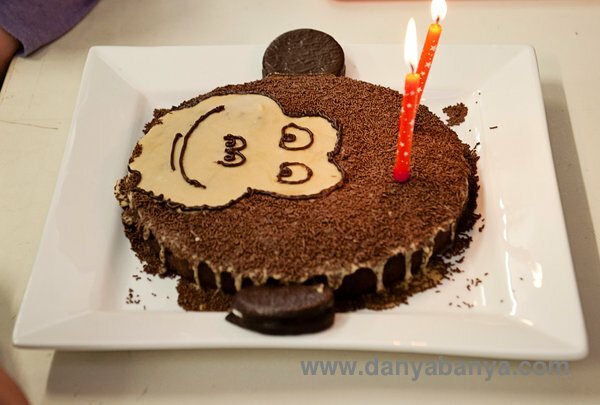 These were served at my daughter JJ’s second birthday party, along with these Zoo Animal Face Masks, and Chocolate & Beetroot Brownie Monkey Cake. It was zoo-ilicious and animal-tastic!